Weddings might be the happiest day of your life but by god are they expensive. This can be a bit of problem as the biggest and best weddings can potentially leave next to nothing in terms of budget for the crucial stag do. Never fear though. It’s perfectly possible to have a buzzing stag do without breaking the bank, and here’s a few ways to do it. Don’t think for a second that a cheap stag do idea means you won’t be getting a quality experience. We take pride in making sure all our stags have a brilliant time no matter the budget. For a fantastic way to start the day, why not enjoy a delicious meal in the highly popular Yates restaurant with the Yates Beer & Banter Stag Do. Enjoy a laid back buffet with the lads, tucking into a delicious and varied buffet with both hot and cold food while enjoying a pint of Carlsberg, Strongbow, John Smith’s or even cask ales with it. You can even get add a 4pt pitcher to share. A simple but tremendously fun idea that’s great for kicking off a stag night out. 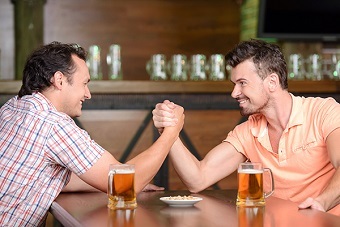 The Smartphone Pub treasure hunt stag do is a cheap as chips activity that’s a ton of fun and of our most popular stag do ideas. All you need is a smartphone with the treasure hunt app installed on it. Using GPS, the app will send you off around a city of your choice to find fun challenges and quizzes. The route it sends you on will take you to a couple of pubs where you can stop off and enjoy a pint or two before you complete the treasure hunt. One of the best things about this activity is that it’s completely self-run so you can do it whenever and wherever you want. Maybe you’re just looking for the traditional stag night out on the town, in which case why not make it a good one with fast track nightclub entry for a city of your choice and a local beer guide to show where all the best bars are. No more wondering around for ages trying to find a decent place to drink and no more long, tedious queues in the cold weather. That’s just a few awesome and affordable ideas that guarantee you a buzzing stag do which won’t leave you skint. See all our stag do activities and give us a call on 0161 341 0052 for more information.